International Flower and Trade Expo 2016 in Kenya this June! This June, the fifth annual International Flower and Trade Expo (IFTEX) takes place in Kenya and it promises to be one of the best cut-flower trade fairs ever. The event will be held at the Oshwal Center in Nairobi, Kenya, and it’s already set to be the largest cut-flower expo on record in Africa. It’s also likely to become the biggest expo of its kind in the world. 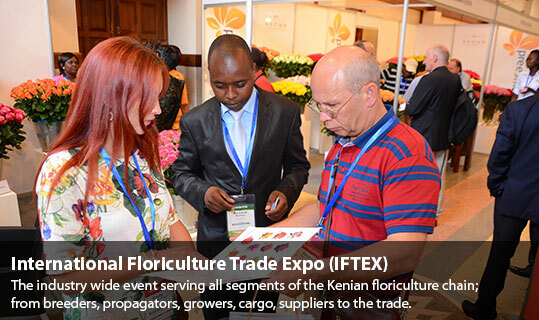 Over the past few decades, the floriculture industry has grown tremendously in Kenya, making it possible for the country to host a flower event the size and magnitude of IFTEX. Besides the International Flower and Trade Expo, the Kenya Flower Council celebrates its 20th anniversary this year, which is a sign of how important floriculture is to the people of Kenya. IFTEX 2016 in Nairobi will feature more than 200 exhibiting companies as well as 4,000 national and international trade visitors (a 15% increase from last year’s numbers). There is currently more than 50 countries scheduled to participate in IFTEX 2016, and the companies exhibiting at the event will include exporters, growers, brokers, propagators, breeders, and other industry suppliers. This international flower expo takes place in a beautiful, stylish building surrounding by gorgeous landscapes, which makes for a perfect setting to indulge in such a glorious event. Expo-goers will have plenty of stunning spaces all around to revel in flowers and have an enjoyable time talking, buying, and selling flowers of hundreds of varieties. Although Kenya has seen periods of unstable economic activity (even to this day it does in some industries), floriculture is an industry that has remained strong and has flourished over the last 30 years or so. We love the fact that many people from around the world will gather in Kenya to celebrate flower growing, trading, and decorating. And, we’re thrilled that flower importing and exporting will be discussed, and that representatives from many cultural backgrounds will come together to take part in a flower extravaganza and share a common experience. Have you been to IFTEX? Or, how have you attended any other major flower expos? If so, what was your experience? We’d love to hear from you in the comments below.